Instead of waiting in line to check-in at a hotel ,travelers staying at select Starwood Hotels and Resorts will soon be able to unlock their hotel rooms with their Smartphones. Can you imagine, you wouldn’t have to worry about losing your hotel key again! I mean, you got enough to worry about right? Never worry about losing your hotel key, or even have to stop at the registration desk, again. According to CNN, New technology being implemented by Starwood Hotels & Resorts Worldwide Inc. plans to offer the more streamlined check-in process in early 2014 at the Aloft Hotels in Manhattan and Silicon Valley. The goal is to allow guests to completely skip the check-in desk, and give them the ability to enter their room with nothing but a smartphone. No more waiting in line, showing the proper identification information and hassling with the front desk. The process would almost be similar to getting your movie ticket or boarding pass on your device. Starwood, a chain that’s heavy on boutique hotels, has a history of tech innovation and employs its own digital team. 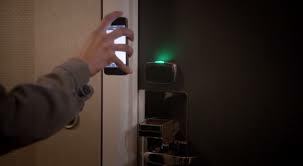 Do you think replacing the traditional hotel key for a smartphone room key will be a good idea?